Reconfiguring your existing system to do something new is painful. Using VirtualBox is not. If you are ready to take the plunge into virtualization, you are ready for this tried-and-true procedure to convert your existing physical machines into virtual clones. Explore distributed hosting options with OpenVPN. The techniques presented in this second article on diagnosing the DNS use simple tools to audit access to local DNS servers from the customer (and bad guy) perspective. Read about the Linux-based production pipeline in this new movie from Paramount. What happens when you put hypervisors on different subnets? How about when the underlying physical machine fails? The answers may surprise you, and not in a good way. Reducing the size of a Linux platform, for those new to the process, can be a mysterious task. 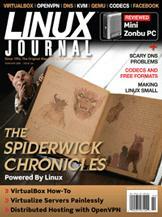 This article takes the mystery out of making a Linux platform small. Introducing KVM, an open-source hypervisor. How to use QEMU to run Linux inside Windows. Learn about codecs, how to transcode, and why free formats deserve promotion.